The best scientist is open to experience and begins with romance—the idea that anything is possible. 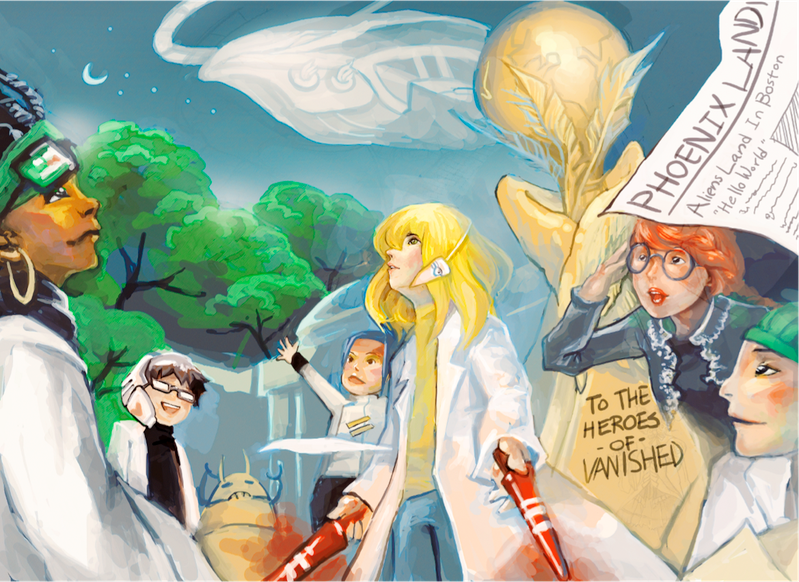 In spring 2011, about six thousand ten- to fourteen-year-olds saved the world—kind of. They participated in Vanished, a game designed and developed to engage middle school students in the practices of scientists, allowing them to frame and solve problems scientifically. This, theoretically, then allowed them to adopt the persona and perhaps ultimately an identity as a scientist (or at least someone comfortable with science). The game was run in conjunction with the Smithsonian Institution’s Center for Learning and Digital Access. The students were able to not only solve puzzles within the game, but also interact with Smithsonian scientists online and visit Smithsonian partner museums throughout the United States to find useful information and have meaningful interactions with museum educators and scientists in their community. By weaving these real experts and experiences into a fictional narrative, we produced an unforgettable experience. The game arose from a discussion with the Smithsonian’s Matthew Carrano. We had established a partnership and were hoping to teach young people about extinction and the threats that are arising from climate change. As the conversation turned to how we might do that, Carrano volunteered that he wished more young people understood that the scientific method didn’t dictate his day or his work at all. His process sometimes started in the middle, or the end, picking up someone else’s data or playing around with ideas and experimentation before eventually wondering his way back to a falsifiable hypothesis. His sense of wonder, he surmised, was a greater professional asset for him and his process of inductive hypothesis generation. He also shared that he wished students knew how social science is. Most of his day is spent sharing ideas or discussing findings with friends, getting excited together about some new puzzle. Carrano’s wishes couldn’t have been vocalized at a better time. There was a new type of game emerging, the alternate reality game (ARG), in which players work in large groups to solve massive problems they couldn’t solve on their own to advance a story being built by the game’s developers. In games like The Beast (4th Wall Entertainment, 2001) or i love bees(4th Wall Entertainment, 2007), these problems, puzzles, or challenges would be disaggregated across the web or across physical space and would often require creativity as well as inductive excellence. Players’ collective efforts would not only solve puzzles, but create a real culture of belonging and shared purpose. They also occasionally created key parts of the game, even if they didn’t know it at the time, by generating theories or resources that the developers could use to make new puzzles. These games, in addition to being exciting experiences that charted a course for what the World Wide Web could be as a storytelling medium, were exemplars of how exciting social learning and creation could be. It seemed clear that this new form might be an excellent match for a learning game that suited the underrepresented aspects of science that Carrano had identified. Further, the ARG format could help with a secondary problem as well—the Smithsonian has an important role as the national museum of the United States, but its rich collections and learning opportunities are largely rooted in Washington, DC. The main institution helps support the national mission through a national network of affiliate museums, but struggles to activate those relationships. One of the defining features of the ARG form is to balance extensive online play with localized events, which seem to build community as well as give the often paranoid worlds of these games a compelling physical instantiation. Puzzles from the website may reveal a place and time for a meetup, at which point players close to those physical locations attend events where new puzzles are introduced and solved on the spot or new information is released. These local players then bring this new information or the results of the puzzle or other engaging activity back to their online colleagues for further discussion and deliberation. It seemed as though, given the Smithsonian affiliate network, as well as the museum’s developing collection of digitized artifacts, that an ARG could be a tremendous opportunity to bring the Smithsonian and its resources beyond the walls of their buildings in DC. As we were beginning to stitch these ideas together, creating an ARG to advance the social and exploratory angles of scientific practice, Philip Bell and the Committee on Learning Science in Informal Environments published their “Strands of Science Learning,” which outlined how informal venues for science learning like the Smithsonian could best play a role in the development of excited, engaged, and even skillful science learners. The sixth strand, indicating that learners should “think about themselves as science learners and develop an identity as someone who knows about, uses, and sometimes contributes to science” (NRC, 2009, p. 4) would be the most relevant to our learning goals for Vanished as a whole, while the other strands would play a role in individual activities within the larger game. The convergence of the Smithsonian partnership, the emerging art form of the alternate reality game, and a careful, thoughtful framework for science learning created a rare opportunity to create what we came to call a “curated game.” By providing a heavily scaffolded scientific mystery with tremendous input from Smithsonian scientists, curators, and educational staff, we produced a living exhibit that reached thousands of young people and greatly extended the reach of the museum. Vanished was a seven-week ARG developed over the course of two years. The game allowed only players aged ten to fourteen and was primarily conducted through discussions in the game’s forums, interactions with Flash-based games and tools on the game’s website, and activities (scaffolded to varying degrees) in museums and science centers across the country. The game’s central conceit was that the players had been contacted by people from the future who needed their help (principally Jasper, a representative of Project Phoenix). They claimed that some catastrophic event had happened between their time and the present, and they needed help from the players to determine the nature of that event as well as its consequences. While players would always be able to change the direction of the game through their creativity and interests, we built the game in advance of its run using weeks of the experience to function as tiered challenges (like levels in a video game), but also as a serialized release of content, like television shows, comic books, and the film serials of the early twentieth century. To promote the game and gather an audience, we wrote articles for major publications, like USA Today, and advertised in a way that we never had before. Billed as the MIT-Smithsonian Science Game, players signed up with no idea what was in store for them. On the first day, players logged in to a video message. Undergraduates we had hired to function as moderators for the forums and role models for players informed the players that the game’s servers had been hacked. The game was to be delayed, but perhaps the players could help. Within a few hours, players had noticed short bits of text flashing during the video. Within a few more hours, players had discovered that there was a large but finite number of these repeated texts and that they were ciphers, which the players began to decode. Within twenty-four hours, they had the entirety of the message translated. Once we had the basic premise, the game unfolded largely in a logical fashion. If you were communicating with people from the future, what would you need to do? And what would they want from you? Week 1. Something’s Wrong/Making Contact: In this week, players are introduced to the game, the fictional contact from the future presented as a challenging distributed cipher. Week 2. Where Are We? : In this week, players crowdsourced data about their local communities, uploading pictures and information about local weather, flora, and fauna. After discovering that the players needed to establish common units with their contacts, players performed extensive conversions for measurements of distance and temperature. Project Phoenix confirmed that the planet is much cooler in the future. Week 3. Where Are We?, Pt. II: The players and their colleagues in the future still needed to establish a common coordinate system to share information about global positions. Players discovered that data passed by Project Phoenix were the locations and heights of the three tallest mountains on the planet, although all of the heights were off by about ten meters, meaning that sea level had risen. It was puzzling to imagine how sea level could rise without global warming, since it had been established that the world was much colder. Week 4. What Has Happened? : Players had to discuss and debate and develop a small number of tests that Project Phoenix could run to determine what could cause global cooling after global warming. Many ideas were discussed, including wandering magnetic poles, extreme volcanic eruptions, and a collision by an asteroid or other material, such as the one that is hypothesized to have rendered dinosaurs extinct. In the end, the players and Project Phoenix determined that it was likely the asteroid collision due to a new, outsized crater in the future. Week 5. How Could This Happen? 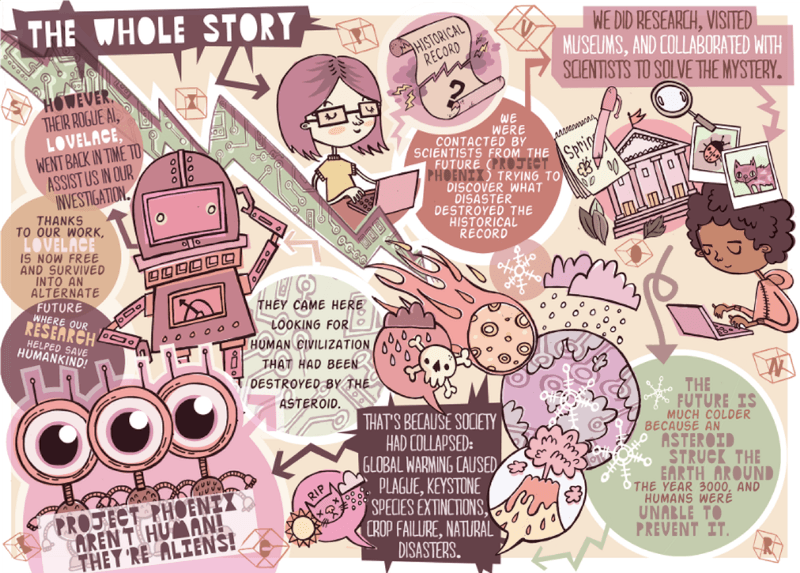 : This week students began to drill into why humanity would not have diverted the asteroid. Documents released through game play in Vanished’s various activities, including flash games, had begun to hint at cultish behavior in the Americas and technology backsliding by time of the collision. Week 6. Explore the Future, Save the World: In this week, players attempted to understand the nature of this technological backsliding through the use of archaeological rovers in the future to uncover artifacts and settlement patterns from the eras preceding the asteroid strike. This allowed Project Phoenix to reveal that they were not actually humans in the future but alien scientists who sought to understand why the once inhabited planet Earth was uninhabited in their time! Week 7. Wrap-Ups And Farewells: The players had learned the fate of the world and were now empowered to make a blueprint for avoiding that terrible future. Our fictional characters were given largely happy endings, and players, mentors, and game runners said goodbye to one another. In the sections below, we elaborate on how Vanished worked and what we were able to accomplish as a means of illuminating how these principles can function in designing a resonant game. Most games pose some sort of problem or challenge to be investigated and solved. Problems in the game that resemble the “real-world” problems that they model, situated appropriately, not only will likely produce more usable knowledge, but may also be more engaging. Resonant games with a compelling and authentic problem are more likely to be great learning experiences. Authenticity should ensure that the skills being developed and rehearsed in the game are near to those needed in the real world. Authenticity is not a function of whether a problem is served in a “realistic” setting, but whether the problem solving seems to have a purpose related to the story or setting in which the player is imaginatively invested. Authenticity also means that the problem students are engaged in is a problem that they understand and that relates to their real lives or their real interests (including fantasies) in some way. Even fantastic problems must take the inner life of the young person seriously. When planning this game, we knew the Smithsonian was focused on addressing climate change, on sharing their collections and resources more broadly, and on innovation, broadly speaking. The alternate reality game’s history of attracting audiences driven to collectively investigate and solve problems seemed like a nice way to address these design specifications. But which problems should we choose? And how might we help students get the most out of their experiences? Learning is promoted when existing knowledge is activated as the foundation for new knowledge. We would attempt to meet players where they are, and although players would be operating in a narrative context, we would ground as much of the narrative as we could in authentic problems. These problems would need to feel real to the players but also be approachable by people aged ten to fourteen. Climate change seemed like a prime issue to structure our problems around, because of its ubiquitous discussion and its looming character—our audience would almost certainly be dealing with the effects of climate change over the course of their lives and were probably aware of this fact in at least some cases. We weren’t convinced that we could make solvingclimate change very compelling though. Experts like Jane McGonigal had already attempted something similar through games in which players imagined their responses to bleak alternate futures, like A World Without Oil and SUPERSTRUCT, to what seemed like mixed results. While there are undoubtedly benefits to games like these getting people to imagine alternate futures, it was unclear that our audience would have enough context to make moves within our story that would satisfy themselves and us as experience creators. It became clear early on that we could create a compelling experience by grounding our narrative and our problems in climate change, while creating within-game actions that were more discretely comprehensible and more developmentally appropriate. Because so many of these strands involve actually participating in scientific activities and approaching professionalization, it appeared that following Carrano’s suggestion would work. We would build a community presented with compelling problems that they could solve using thinking patterns, tools, language, and so forth consistent with scientific practice. This would be driven by (but not be limited to) inductive probing and hypothesis testing. Our narrative would be set to create problems that required careful thinking and the understanding of complex problems, and each of those problems would build on one another and follow in a reasonable manner. For instance, in the game’s first challenge, we provided no clear path forward. Students noticed the codes we had placed in the video we showed, perceived them as codes, searched online for solutions and tools to break the codes, and then organized the ninety-nine separate code fragments players could discover into the single message from Jasper and Project Phoenix. One player wrote, “I thought I was going to do science, not breaking codes,” and we were able to reframe the situation—this sort of inductive process is scientific thinking. The subsequent challenges, in which players collected data, presented it to their “futuristic” correspondents, and discovered that they had a real communication problem due to issues with units and location also had to solve a fundamental practical problem. This communication problem touches on central scientific institutional questions in a way that enables players to interrogate and understand why unit systems and coordinate systems are important. Units are frequently presented as a demanding task that must be arbitrarily done, but the ability to precisely communicate information is something that practicing scientists crave out of necessity. The nature of the problem in this game induces an authentic craving that most middle school science labs fail to do. Finally, with a healthy community developed by the fourth week challenge of helping the Project Phoenix scientists decide what tests to run to ascertain what event caused global cooling and disaster, we were able to help players build informal hypotheses to test. First, they had to work from their own knowledge and from research to determine what sorts of events cause widespread cooling. Discovering potential causes like supervulcanism, asteroid crashes, and the wandering of magnetic poles was exciting, but it also led to further questions. What evidence could Jasper and his colleagues look for in the future? What tests should they run? While players may not have precisely developed experiments to run, they nevertheless had to think carefully about the problem. In the instance of the ultimately correct hypothesis, for instance, players searched for all the existing craters on the planet and provided the coordinates so that current craters could be ruled out in a global search. They also extensively researched the detritus and material that would be found at different types of collisions so that the community could learn as much as possible about the asteroid strike should one be found. It is important to note that, in each of these situations, we did not let the players drift in the wilderness. The field of problem-based learning is certainly an inspiration for our work in Vanished, providing a framework for how to think of engaged learning that situates factual content in the processes, disciplinary lenses, and contexts where that knowledge would be used. In a response to a critique of discovery learning approaches (particularly because of the tremendous cognitive load involved), researchers involved in problem-based learning and inquiry learning assert that by working through problems, learners can develop “content knowledge, epistemic practices, and soft skills such as collaboration and self-directed learning,” and that these approaches are in fact heavily structured with three types of scaffolding (Hmelo-Silver et al., 2007, p. 99). The scaffolds discussed are those that make disciplinary thinking and strategies explicit, those that embed expert guidance, and those that structure tasks to reduce cognitive load (Hmelo-Silver et al., 2007). Vanished was able to use each of these types of scaffolding, in one instance or another, to reduce the cognitive load of any single problem, and to model good problem-solving skills to players. The game’s staff of undergraduates was the first level of intervention. They helped players develop hypotheses (and steered them away from weak hypotheses, like an apocalypse caused by the end of the Mayan calendar); contextualize evidence and problems; and otherwise strategize explicitly. In the excerpt below, you can find a moderator scaffolding an interaction, but also players modeling and expecting professional practices from one another. Maybe they ran out of coal deposits and oil deposits to make fuel from? We could give Project Phoenix the coordinates of the largest present-day reserves and have them investigate how much oil and coal is left. I don’t have time to do any research on this right now, but I think it’s an idea worth investigating further. That is an excellent idea! so where today’s major oil reserves located? I think the Middle East (Kuwait, maybe Qatar), and the Gulf Coast, and Alaska. and etc. so basically we are battling the countries with the most oil preserves so the US can gain control of them? This is a very good theory too, and we could see when the last bit of oil or coal was taken out of the reserves. Well [Player 6 username], I have this online “clock” that tells a lot of different things and on it is a oil reserves countdown and right now it is at about 38 years left. yeah, well we thought oil would run out about now a long time ago, so i think that estimates are too small. And besides, if we start to use less, that would increase the time. Wow that is really cool [Player 7 username] where did you find it maybe more of us could purchase that type of clock unless its rarely valuble and it sounds like it is! Smithsonian scientists were also available to provide expert guidance in times of explicit need, via a moderated video chat. Conrad Labandeira, an expert in mass extinctions, was able to help the player community make sense of divergent data and learn how to make sense of speciation. Liz Cottrell, who studies volcanoes, was able to help the community understand how volcanic activity could cause mass extinctions, and she provided possible tools for investigating the future. 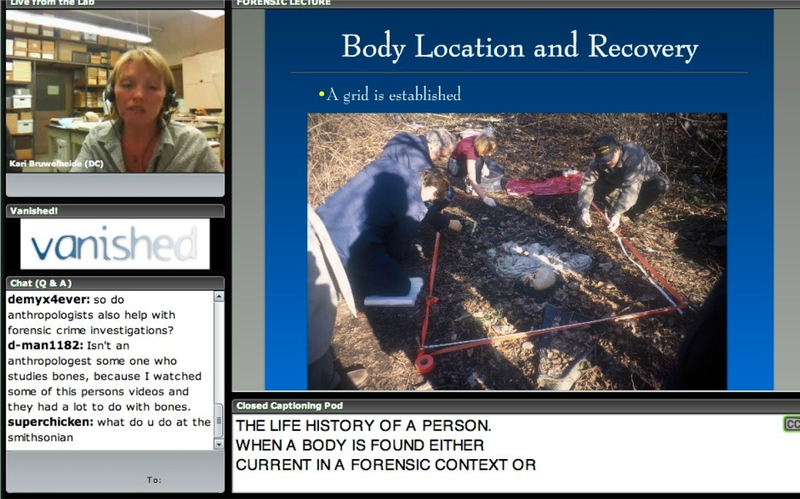 Finally, when it came time to study the remains of the settlements of the future, Kari Bruwelheide shared her knowledge of forensic anthropology and helped students make sense of their findings. Importantly, these scientists were not just experts, but experts with an educational mission. They treated the players as colleagues, refrained from speaking down to them, and were able to scaffold the search for answers when it was called for, as opposed to simply providing answers in all contexts. In these ways, we believe we provided players with problems that felt authentic to them, connecting them to the pressing issue of climate change while creating a succession of activities that logically followed one after another. We were able to situate their work in a context where the skills they would be using and developing were relevant to the actual professional practice of science. And we were able to situate them as scientists socially while providing a great deal of mentorship and help from MIT students and from professional scientists from the Smithsonian. Each of these, we believe, created an environment in which players could develop an emotional attachment to, skills in, identification with, and fondness for science. Collective Intelligence, Citizen Science, and More! Almost all learning is highly social, because knowledge may be said to be social—symbols, ideas, and knowledge are all given meaning and weight by the context in which they are operating. Further, learning in a group context can provide greater resources for learning than any given learner may have on his or her own. Respecting the social nature of knowledge and the potential benefit of shared tasks such as problem solving may have tremendous benefit for learners. Although new problems may arise, like players benefiting from the work of others without contribution, these are likely outweighed by the benefits of learners formalizing and explaining their thoughts as well as developing collaborative capacity and skill. The principal danger of recognizing the social nature of knowledge is maintaining a myopic view of content, failing to see where your students may have their own misconceptions or perspectives that require a more flexible path to understanding. Further, approaches that focus solely on the individual miss opportunities to practice the collaborative skills students will need in contemporary workplaces. We were tremendously inspired by the socially engaged nature of the ARG. Having players who collectively addressed complex challenges seemed like a tremendous opportunity to prepare young people for an important aspect of the twenty-first-century working world, developing collaborative skills and a sense for how to tackle challenges too large for any individual to address. These activities would require some guidance, but we largely found our players to be tremendously capable. 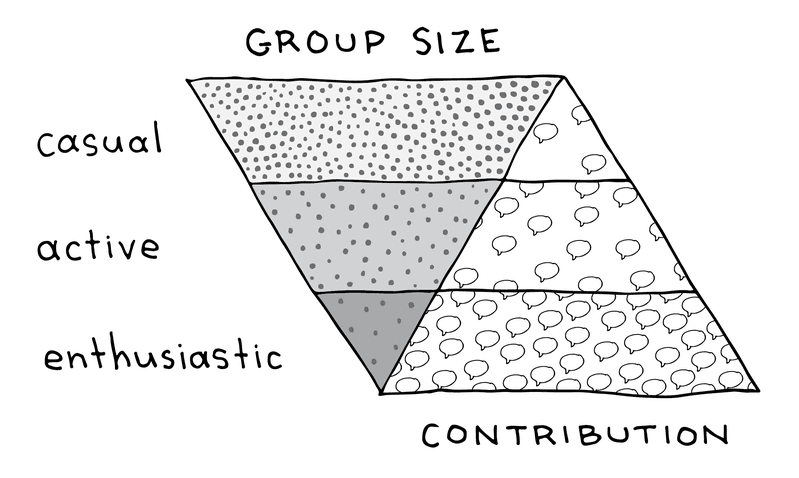 The capacity of large groups to solve complicated or complex problems has been called “collective intelligence.” We were enormously inspired by researcher and designer Jane McGonigal’s careful catalog of the ways in which the design team for 4th Wall’s i love bees required and addressed player collaborations (McGonigal, 2008). One key collaboration was performing the investigations necessary to turn a growing list of seemingly random strings of numbers into the dates and locations when and where 220 pay phones would ring and deliver exclusive audio content to whoever answered. Players of i love bees were also skilled archivists and computer scientists, noticing some pseudocode that the game’s designers developed as a means of communicating that the game’s narrator was an artificial intelligence. These two challenges required players to produce a wide array of hypotheses, to imaginatively develop or investigate these hypotheses, and to resourcefully, creatively chase down the information and answers they sought. For instance, the players working to decode what ultimately were payphone coordinates pursued a wide array of possible interpretations. The players established separate threads for literal (we just need to go to these places), relative (what’s at these coordinates? ), and numerical hypotheses about the meaning of the numerical strings. Additionally, we were inspired by researchers studying the larger context around game-play activities, or what James Paul Gee calls “The Big ‘G’ Game.” Addressing the idea of “affinity spaces,” researchers were just beginning to study how players would investigate game systems together in online forums while also developing relationships with social significance through their participation in shared activity. Members of these affinity spaces may have been less likely to share personal information unless it was germane to a given topic, but communications were frequently respectful and well organized, presumably because of the deep shared interest in effectively uncovering how to improve their game play. In Vanished, our players solved problems in which the data were widely distributed, puzzles that required a great deal of detective work and problem solving, and challenges that required simply being geographically distributed. The puzzle described above, in which a coded message was split into ninety-nine unique fragments, required players to imagine what their text strings might be, to infer that they were codes, and then to assemble the decoded fragments into a coherent message. Other challenges had them collecting temperature and creature data from their zip code, or going to nearby Smithsonian affiliate museums (or encouraging cousins, friends, etc., to go if no players reported being nearby). Finally, a great deal of players’ work came from simply coordinating activity, encouraging one another, and crowdsourcing knowledge around various in-game puzzles and challenges. They worked diligently to communicate with one another and share knowledge and practices to solve the game’s mysteries. Finally, we drew inspiration from Albert Bandura’s notion of social cognition (Bandura, 1986), the idea that young people develop a sense of self-regulation and self-efficacy from the models provided by those around them. If good behavior is modeled and reinforced by all members of a system, the behavior becomes mutually constitutive and drives what Bandura calls “reciprocal determinism.” We wished to conduct good community hygiene to keep the dialogue between players positive and productive, within parameters. We wanted students to get to know one another and conduct some amount of friendly discourse while not turning the game into a wildly off-topic discussion space. We tried to make our community much like the communities our players would encounter in other places online. Players had simple profiles as their principal means of communicating their identities and primarily interacted through posts on a shared forum. Of course, as our players were between the ages of ten and fourteen, we had to work to protect them from themselves and from others. This is in part just good practice, taking good care of your young players online, but doing so is also legislated through COPPA, or the Child Online Privacy and Protection Act. While the COPPA regulations are carefully elaborated in many locations, for our purposes, the laws cover what content is appropriate content for a website for children under thirteen, how much information children are allowed to share on the site, and what is done with that information. We sought expertise in terms of how to oversee our data and worked closely with MIT’s internal review board (the Committee on the Use of Humans as Experimental Subjects, or COUHES) to develop our plan. We did engage players from all fifty states and Puerto Rico as well as a roughly equal proportion of boys and girls (51%:48%). Players were from zip codes with household incomes slightly higher than comparable to the US average at the time. They could see only what state other players were from, though, as well as game-related information. We made the challenges of monitoring a community of ten- to fourteen-year-olds into benefits. Every post in the forum was checked by our undergraduate community members for appropriateness and for identifying content like a player giving out his or her full name, address, or other contact information like an email address or phone number. We had some concerns that players would be discouraged by not seeing their thoughts posted immediately, but we were able to keep the time to filter extremely low. The players seemed happy with the arrangement, and we had to ask only one player to modify behavior. The resulting community was friendly, chatty, and productive without becoming the lowest common denominator basement that many Internet comments sections often become. We also chose a diverse group of undergraduate mentors to moderate the forums, people with a history of working with youth, old enough to be aspirational but young enough to be relatable, and we did weekly video updates in which the mentors would respond directly to players to build the relationship. Our players were interested in our mentors and had many interactions with them, but they were even more interested in one another and, on average, spent 12 percent of their time looking at one another’s user profiles. These user profiles were sparse, though, to protect players, but it’s an indicator that providing players with ways to get to know one another within the bounds of COPPA is valuable. The Web Conferences. I don’t know about everyone else, but I had always wondered what exactly it means to be a ‘scientist’. I must say that my favorite thing about Vanished was the web conferences! It gave us all a chance to speak with amazing scientists who work in very diverse fields of science. you should definatly get some more video conferences they were a fun and easy way to learn about so much!!!!! I didn’t actually expect these to be very fun but I think they were my favorite part of the entire game. Importantly, there is one chief social design tool that we did not use—role playing and roles to drive identity and focus tasks. The chief identity work that we hoped to do was to have students see themselves as at least comfortable with science and the idea of being a scientist, but ideally, eagerly seeing themselves as scientists in their adult lives. The creation of roles in a game typically divides game tasks into coherent jobs—many fantasy role-playing games adopt “tank,” “damage-dealing,” and “healer” roles. Roles can even be arranged in opposition to one another, as are the “corporation” and “runner” roles in the card game Android: Netrunner. It was important to us that our players have a great deal of flexibility in how they position themselves toward other players and the activities in the game. Games with roles are generally ongoing and enable players to try out different roles and other social flavorings to find ones they are comfortable with. Because of our game’s short timeline, we were reluctant to overspecify how people could contribute. In fact, ARGs tend to benefit from an “all hands on deck” mentality, where people contribute as much as they can, wherever they can and want to. We still believe this to be a compelling dimension of the format. In informal education spaces, it is not necessary for every learner to perform every activity in the same way—in fact, there is a benefit from collaborative activities in which learners can model activities they are good at for their peers, and in which students develop skills around finding roles for themselves in groups. We wanted to capitalize on this opportunity while scaffolding the ways in which players might contribute in Vanished. Although little evidence to date supports the idea of learning styles, evidence does suggest that children vary their efforts in playful situations as their goals change. Similarly, evidence shows that good learning is voluntary and has clear goals that are meaningful to the learner. Learning activities that have multiple pathways to knowledge and learning designed into them are simply more accessible to students. Further, opportunities for learners to modulate their effort allow them, within bounds, to develop a more intrinsic relationship to knowledge, free from the extrinsic pressures. Uniform, one-size-fits-all approaches to education can be effective for a great number of students but may fail to recognize and to provide aid to the students that need it the most. Many education projects in systems already provide accommodation to learners with disabilities and differences. Less common are educational ventures that have opportunities to sometimes modulate effort. In ARGs like The Beast or i love bees, the developers at 4th Wall Entertainment noticed a phenomenon in which a small number of players would diligently work to solve just about every problem in the game or contribute meaningfully to the generation of game-related content. Another, larger group made smaller, perhaps less consistent contributions to the game, and a final, much larger group contributed in minor ways, largely watching the action as it occurred. The 4th Wall developers call this the ARG pyramid (see figure 4.1). Figure 4.1 The ARG pyramid, showing varied proportions of players by participation and contribution. Similarly, online collaborative spaces like Wikipedia have developed their own name for this pattern, calling it the 90/9/1 problem, meaning that 1 percent of their users are heavy editors and contributors, 9 percent are moderate editors and contributors, and 90 percent simply use the site for reference. Jane McGonigal’s EVOKE ARG, conducted with the World Bank, released figures that revealed an 88/10/2 split. Vanished, however, had a 69/25/6 split. Of course, it can be challenging to standardize what it means to be a “heavy,” “moderate,” or “casual” user across very different activities like this, but we believe that we were able to “square the ARG pyramid” a bit by designing multiple pathways for players to contribute. Players of Vanished could not only select how they wanted to contribute, but could contribute in different ways over time. Our inspiration for this model was the same one that drove Osterweil’s freedom of effort principle (see chapter 2). Scholars of play Peter and Iona Opie (1969), studying children’s street games in 1960s England, noticed that most children, when playing a game like tag, will be actively running away from other players, or even just running, and then will stop and hang back for a while. Perhaps out of breath, perhaps just observing the scene or checking in with themselves, these players would suddenly find themselves at the periphery, possibly rejoining the fray, or possibly remaining at the edges for the rest of the game. Vanished’s diverse array of activities was designed specifically to provide players the opportunity to decide how they wanted to contribute to the community each time they logged in. We also drew inspiration from Gee’s “multiple routes principle.” Gee writes that in good games, “there are multiple ways to make progress or move ahead. This allows learners to make choices, rely on their own strengths and styles of learning and problem solving, while also exploring alternative styles” (2003, p. 105). By affording players a certain level of autonomy and choice, we believed that players could coconstruct their preferred experience with us. It is important that in an informal learning space, learners be accorded such leeway. As discussed above, players had several opportunities to participate in the central mystery, through active problem solving, performing organizational activities, or simply lurking. In this section, we show other pathways within the game that players could use to contribute to the group’s collective progression through Vanished. We feel that all these pathways are not only valid, but incredibly valuable ways to contribute to the community. One of our major alternative pathways in the game was to play small Flash games that were released each week in conjunction with dispatches from Jasper and Project Phoenix. The ostensible fiction was that many of these games existed for the original MIT-Smithsonian Science Game, so undergraduate support staff members were releasing things from the archive as they saw fit. In the first week, we provided players with the text assembly tool Amalga, which was essentially a “refrigerator magnet poetry” tool that allowed players to load in their fragments and reorganize them in different ways (figure 4.2). 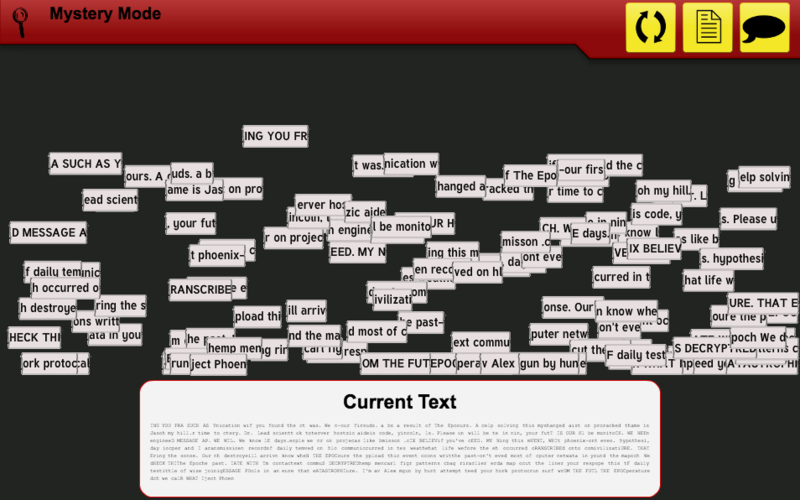 Figure 4.2 The Amalga tool, used to assemble player text fragments. Although the tool was not a game explicitly, we tried to ensure that players would have an easy way to complete the hardest part of the first challenge. It was important to us that the community feel sufficiently challenged by that first puzzle, but that they also felt entirely capable of solving it and that they experienced success. In the following week, when we rolled out Nate’s Swamp Hunt, we hoped that the game’s central mechanic of converting units would help players think about the importance of conversion, and perhaps give them the opportunity to practice that skill. The game’s protagonist, controlled by the players, has received directions to a fortune buried in the swamp by an eccentric and now-deceased uncle. Uncle Nate provided directions in unconventional measures like “trombones” and “snakes,” but the players have only a group of uniform-length boards with which to cross a perilous swamp. By carefully converting from snakes to boards and through efficient use of boards, players could uncover a series of treasures hidden by Uncle Nate (see figure 4.3). Figure 4.3 Nate’s Swamp Hunt, a game involving unconventional units of measure. After releasing Nate’s Swamp Hunt, however, the game’s staff discovered to their (mock) surprise that a seemingly rogue artificial intelligence, escaped from Project Phoenix, had ensconced itself in the game. 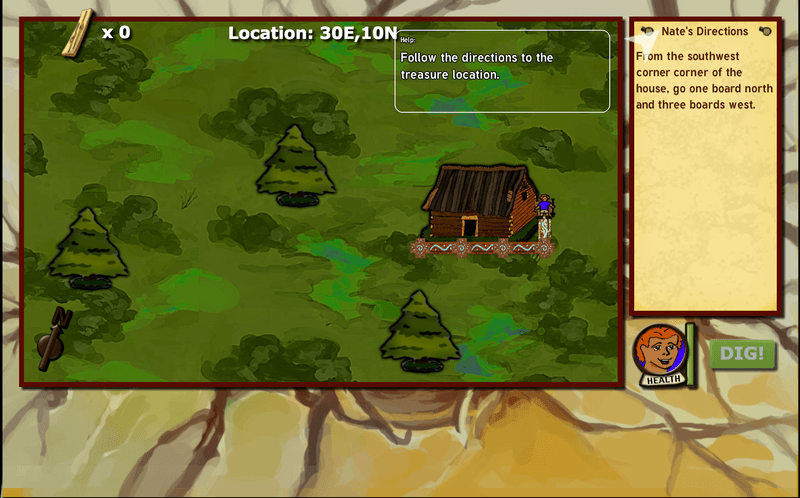 This AI, who called herself Lovelace (see figure 4.6 for an artist’s rendering), created a reward system in the game, allowing players to gain points for playing Nate’s Swamp Hunt, which could be used to unlock documents that she had taken from the Project Phoenix databases. These documents would prove to be mysterious artifacts of the human future. In the Education Arcade, we place a high value on providing players with means of participating in our games because of their intrinsic interest. In other words, it is important that players should want to participate in our games because they are fun and compelling in and of themselves, not because they want a certain score, a badge, an achievement, or some other kind of extrinsic reward. Research in the field indicates that extrinsic rewards tend to lead people to value the rewards, as opposed to valuing the activity that has been incentivized. 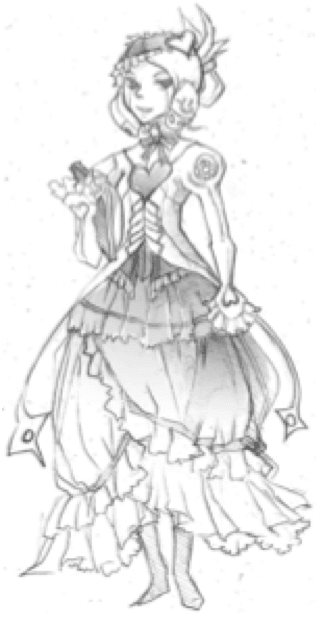 These strong commitments drove us to make Lovelace a somewhat hostile antagonist, calling attention to her creation of a pool of hidden documents, only unlocked by playing games that had no connection to the documents themselves. We felt that the compromise, and winkingly including the players in the joke, enabled us to provide fun, intrinsically interesting games within the larger structure of Vanished while doling out content at a slow pace and, most importantly, allowing players to find a way into the game or to throttle their efforts down if they wanted to. 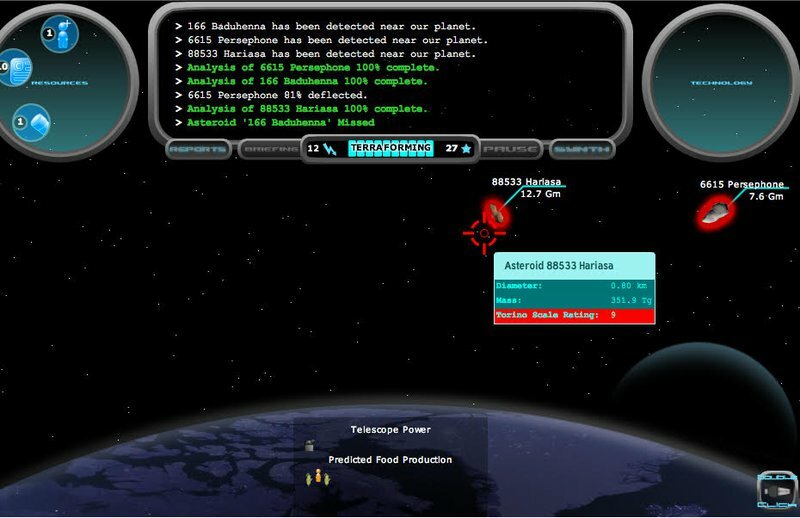 One other Flash game, released in week four, called Astrodefense, asked players to defend a futuristic space colony from incoming asteroids, both by carefully managing the colony’s resources and by developing sufficient technological capability to defend against larger asteroids (figure 4.4). The game included a great deal of information about the types of asteroids and foreign bodies that might approach from space, and about how the weaponry to defend the earth might develop. In this week, players had to think about why it might be challenging to defend against an asteroid strike in the not-too-distant future. Figure 4.4 Defending your space colony in Astrodefense. Finally, in the last Flash game, players got the opportunity to explore the future from which Project Phoenix was calling with the control of rovers not dissimilar to the rovers NASA has sent to explore Mars. Unlike the previous Flash games, players were now, in game, connecting to the world of Project Phoenix. The application to use the rovers was essentially a Zork-style text adventure with a graphical interface. Players had to manage resources to cover the maps, scan for the archaeological remains of buildings, and dig for artifacts (figure 4.5). The story of humankind’s slow descent into nineteenth-century technology was chronicled in the structures, artifacts, and documents uncovered in this process. 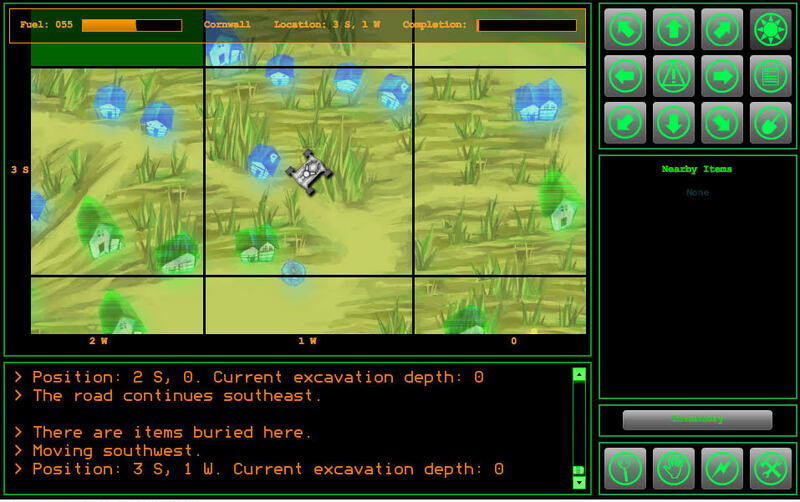 Figure 4.5 The rover that players used to explore the remains of settlements in the United States. Lovelace would, of course, also give out credits for other activities in the game, like uploading data for various challenges and visiting the affiliate museums. These tasks were legitimate parts of the larger inquiry process of the game, but they manifested a couple of approaches to engaging players who might have been be lurking more deeply. The first approach was through credits, but the second made them potential heroes by dint of their geographic location. In the first data challenge, uploading temperature and speciation data to the system, enabled players to provide the special local data that they and few other players probably had access to. Once the activities in affiliate museums kicked off, players were provided with an opportunity to give real aid to the Vanished community by visiting a museum (as in figure 4.8) on the weekend to, for instance, participate in a demonstration about keystone species. One player drove from Montana to Colorado to participate in a museum event. Figure 4.6 An artist’s rendering of Lovelace. Figure 4.7 A screen capture of the video chat with Kari Bruwelheide of the Smithsonian. 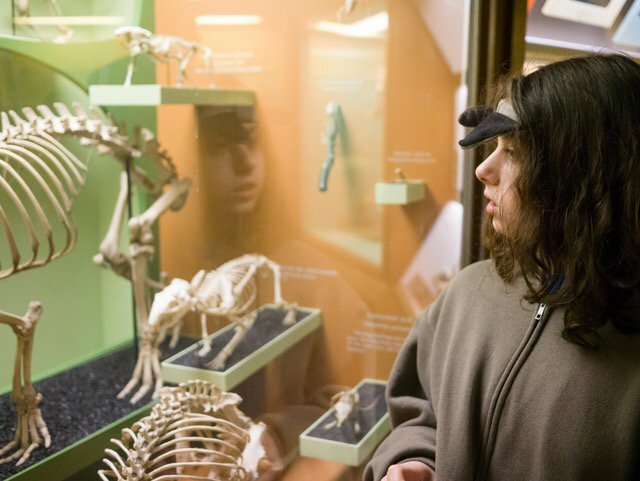 Figure 4.8 A child examining artifacts at a Smithsonian museum. 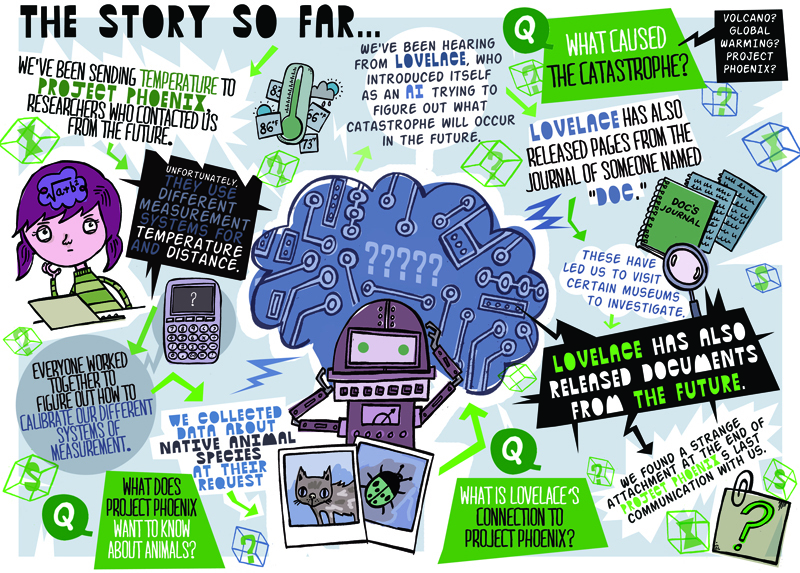 Even though 70 percent of players engaged in the Flash games and only 7 percent were able to attend the online conferences with scientists, some players emerged only to connect with the Smithsonian scientists, or only to engage with Lovelace in her rare appearances. They were all a part of the experience and, we believe, came away from the game more predisposed to engage with scientific practice than they would have been prior to the game. It’s difficult to prove this, of course, but we are hoping to conduct a follow-up study now that our players are in their late teens. Not all players did the same things, but they came and hung around a while—we hope that means something. Good narratives often encourage constructive make-believe behaviors in players. Players who are pretending have opportunities to find new meaning in concepts and skills and to try on potentially generative new identities. Resonant games that allow students to make believe and to cocreate can provide opportunities to project their identity into new roles and consider new ideas with a flexibility and curiosity that may not be available in more straightforward instructional settings. Compelling make-believe experiences require art and science to be as effective as possible. Great learning can occur without make believe or cocreation. Nevertheless, learning is frequently better with a deep investment on the part of the learner. With a deep investment, learners will persist, consider new perspectives, and even celebrate the tasks and knowledge they are engaged with. This idea of “meaning something to someone” is crucial to understanding resonant games. As mentioned in chapter 2, games are designed experiences. Games cannot be one-size-fits-all, but should be directed at creating experiences that can be meaningful to many people in many different but important ways. Traditional storytelling tools like narrative and make believe can be crucial to pulling people into your experience and helping them make sense of their experiences. Narratives structure events sequentially and provide a framework to understand how ideas and experiences might build on one another. Further, make believe allows players to be more receptive to new ideas and more awake to different possibilities and experiences (Deterding, 2016). We developed the narrative for Vanished in part inspired by the narratives that had so effectively worked for games like The Beast and i love bees. We also developed our narrative to inspire players to connect to our activities and to climate change. We intended our narrative to organize a series of events, to build suspense, and to deliver surprise and catharsis for our players, while helping them make sense of their activities in a fictional but still situated environment. This dramatic compression was essential, allowing us to bring the message of climate change’s implications home to our players. But this wasn’t the only time compression we employed. We needed to keep our challenges fresh each week, while ensuring a steady build to the climactic reveal that Jasper and Project Phoenix were aliens and that Earth had been depopulated of humans. It was important that the challenges drive the narrative, not the inverse. Narrative in video games can often take the form of a cut scene, taking you out of the action. For us, it was important that the challenges have a narrative reason to occur, and that the results of the challenge feed back into the narrative. We also had to manage our own workload and find a way to release the game in a way that would allow us to help our young players manage their own time. More traditional ARGs could be round-the-clock phenomena, posting information at any hour, creating a player base that connects to the game constantly, ensuring that they don’t miss anything. We decided early on that we should release the major content dumps and puzzles of our game in serial fashion instead, preparing a set amount of content for each week. Game staff were still watching the game in real time. Using the vague challenges of time travel as our rationale, we assured the player base that it was important for communication with Project Phoenix to occur once a week, giving them a dedicated time to give most of their attention, and giving our small team time to react to whatever players threw our way. Serialization had a benefit beyond the logistical, however. The film serials of the 1930s to mid-1950s were frequently science-fiction or action adventure stories that contained exciting plots designed to entertain young children. Most episodes in a serial ended with a cliffhanger, a moment of suspense that pulled people into the experience, thrilling them and keeping their interest until the next episode. These stories were produced cheaply and inexpensively, so thrills were frequently the focus—characterization and internal logical consistency were not often important. Our focus on STEM education meant that internal consistency and logic were much more important to us, but we believe we benefited from the “rising action into a cliffhanger” structure, as well as something that we can hypothesize about—capturing the player’s imagination and play between episodes. Film scholar Scott Higgins, while cautioning that there are few records to this effect, points to some evidence of how serials would shape the play of children between episodes. He quotes from early twentieth-century sociologist Alice Miller Mitchell’s Children and the Movies: “The movie has become a new back yard for the after-school-hours child. … Not only is it a better and a more interesting playground to the child, but it makes more attractive to him his own playland, for when he returns from the movie to his ‘back-yard’ he has new ideas of what to play and how to play it. He and his little companions congregate and begin to re-enact the film they have seen” (Mitchell 1929, pp. 75-76). Higgins writes, “In Mitchell’s estimation, motion pictures were both a replacement for the traditional play space, and a force for reconfiguring that space. … The sound serial’s formula of regular combat embedded in an overarching mystery would seem tailored to children’s preferences, perhaps because they occupy story and play’s shared territory of contest and the puzzle (see Murray 2004)” (Higgins, 2014, p. 107). Although Vanished had only hints of violence at the very end, we absolutely pulled our players into weekly contests and puzzling with the game’s systems and models of the world, embedded in the time-compressed narrative about the hyperobject of climate change. Thus, where early sociologists were concerned about the “emotional possession” (Blumer, 1933) that these patterns of consumption aroused in young people, we believe that we were able to draw in both their emotions and their intellect to engage deeply with the work of being a scientific community because unlike the sound serials, Vanished was interactive. The story could not move forward without engagement from the players. In the time between the weekly transmissions and puzzles, there was discussion about what would happen next. And at the beginning of every chapter, we had gifted illustrators draw “the story so far” cartoons, which functioned similarly to the “previously on” edited clips that catch up or remind audiences of past episodes at the beginning of contemporary serialized TV shows (figure 4.9). Figure 4.9 “The story so far” image reminded players of past game action. Higgins does discuss ARGs in his paper, but he sees them as the playground to act out contemporary narratives with rich characterization like Lost. Vanished, as a serialized ARG, was able to ritualize the players’ engagement and bring the scientific, investigatory imagination to bear in their in-between play. While we know that players would sometimes hang around in the forums between dispatches, we think their imaginations were also engaged between episodes. In recent years, we have seen online communities spring up to discuss what will happen next on a suspenseful show such as Lost or Breaking Bad, a developed universe for fan theories and speculation, and we saw the same behavior on our forums. I agree that all those are logically ideas, but did you ever consider the fact of a World war 3 or a real cold war. Our players were heavily invested in our characters and our story, and so they performed a great deal of truly challenging work. Even if players were largely playing the Flash games, they still had to perform challenging tasks, and they saw the game as worthy of their time and efforts. Our players, we believe, saw themselves as protagonists and as scientists. And we rewarded their make believe by playing with them in a manner typical of ARGs. We listened to what the players were saying and doing and did all we could to play with them. For instance, Lovelace was a character invention that solved storytelling and game design problems for us, but she became a fan favorite because of the mysterious and playful actions she engaged in with the player base (thanks to her puppet master, project manager and codesigner Caitlin Feeley). Lovelace’s story and her role within the universe of Vanished expanded over time, and when Lovelace was freed at the end of her work, like Ariel in The Tempest, there was some debate among the players about the ethical thing to do with an AI—should they teach it how to be human, “set it free”? While the players developed a distrust of Jasper and Project Phoenix as their answers about the future of humanity became more evasive, the players’ interest in a future that was possibly their own deepened tremendously, and when all was revealed in the end, the players were very understanding and forgiving of the unreliable guide we had created for them. Perhaps the best indicator of our players’ investment in our story was that, about halfway through the game, a technically skilled player announced in the forums that he had found a way to hack into the repository of documents that Lovelace was playfully/cruelly doling out at a slow drip. He did not, as you might expect, simply link to a repository of game-breaking information, but instead he asked what the game runners would prefer, and what the community would prefer. In short order, he received a clear message from his fellow players: “please don’t spoil things for us—we’re having too much fun!” (We gave him some additional credits for his ingenuity and kindness.) In the same way that parents and children in a family may, for a year or so, talk about Santa Claus as if he’s real, even though the children have their suspicions or knowledge to the contrary, we found a sweet spot where children and adults could have some fun pretending together, for a time, that things more fantastic than reality were occurring, and we inspired them to do some very challenging work to keep up the illusion. This was a shared, temporary center of focus, as in Salen and Zimmerman’s (2003) interpretation of Huizinga’s (1930) concept of the magic circle, discussed in the previous chapter. We Saved the World—Now What? On May 22, 2011, we concluded the game. Players received a message from Lovelace, reporting back from the alternate future just as the scientists from Project Phoenix were arriving at the now intact Earth in the future (see figures 4.10 and 4.11). Figure 4.10 The final image of Vanished, showing players the celebratory moment of contact with Project Phoenix. Figure 4.11 The summary image from Vanished, celebrating all that happened. While an evaluation conducted by educational research firm TERC (Simon et al., 2012) found that only about 670 players hung in with us into the final weeks, the players we had were overwhelmingly positive about their experience. I completely loved Vanished! I don’t know what to do with my life now that it’s over. … haha, just kidding. But it seriously consumed most of my life for the 8 weeks it went on! I really feel like a future scientist now. Imagine, when we all have famous jobs at research centers across the world, someone will discover how we all as kids worked on a game. Players went on to create fan art, to implement their own text-based role-playing games online, and to create fan sites. The players created their own mailing list to continue conducting investigations together, and they offered to conduct bake sales to fund a sequel to Vanished. My students learned how to work together to solve problems they knew nothing about to start with. They learned how to assimilate knowledge and then apply what they had learned. They learned how science really works! I had one student … who even became very involved in cracking the codes using all sorts of different methods. Every day he would come into class thrilled to tell me what he decoded and how he did it. I overheard a few students mention that they now want to be scientists when they grow up. This does not mean that we can rest on our laurels. Most of the players we attracted to the game were already interested in science (even if only 39 percent listed a STEM discipline as their favorite subject in school). And the attrition over the course of the game makes it challenging to advance this model as is. Our principal endeavor now is developing a model for the classroom ARG in a box, providing principles and structures to help teachers develop their own extended narrative investigations in a smaller community that is easier to scaffold for all learners. Still, there is something to be said for the development of large-scale informal games like Vanished as well. A narrative social mystery with multiple learning pathways and authentic problems in which young learners can participate in a new community for a time with others should be an option. If institutions like MIT and the Smithsonian were able to produce one such event every few years, problems like player attrition may be solved because even as the specifics of the event are unknown, the type of event it is could be known, enabling us to reach enthusiastic new players while helping us to better refine the games’ various pathways and engagement models. In any event, games that combine authentic problems, clever social design, narrative, and imaginative cocreation, as well as providing multiple pathways for players, have a much greater opportunity to be resonant with young learners. 4 “I Wish I Could Go On Here Forever”A Game for Science PracticeThe Design and Development of VanishedLearning to Save the World by “Saving the World”Collective Intelligence, Citizen Science, and More!Squaring the ARG PyramidMake-Believe ScientistsWe Saved the World—Now What?